This blog was written by Burning Hill Singer Misti Koop. It is first in a series of blogs from North Dakota Burning Hills Singers. Ten days into rehearsals, it’s time to leave our Minneapolis studio/rehearsal space and relocate to our home stage in Medora, ND. Some music is now memorized, some dances are in our bodies, the script is under revision, and we have one completed costume. After a promotional performance in Fargo and a few in Bismarck, we finally arrive in Medora for our first on-site rehearsal! Secretly, I’ve been waiting for this moment with excited anticipation. It is my week to drive the cast van. We load everyone in with all our bags and rehearsal gear. About halfway between Belfield and Medora, we reach the MOMENT. We drive up the backside of the stage. The new cast members are still in awe as we drive up up up the orange-dirt-road to the theatre. We’ve been told that our studio space is a lot smaller than the actual stage. NOW… this statement makes sense. Our stage is HUGE! So wide, no ceiling – just the sky. Truly breathtaking. I give the stage a “hug” as we walk across it for the first time. After ten minutes of bathroom, water, putting our things down, changing shoes and grabbing our rehearsal microphones… we begin numbering the opening. Here we go cowboys and cowgirls! This is the first blog, in a series of blogs, Misti will write to give YOU a behind the scenes look at what goes into producing the “Greatest Show in the West! Great blog Misti! It is fun to read how much time and effort it takes to put on the show you do. Your energy is incredible as is the whole groups! Another great season brought to us by some incredibly talented performers and people. Attended the musical on The 4th & it was terrific.Everyone did a swell job, in spite of the high humidity & the warm evening. It is so fun to read this “Medora” reflection by Misti. She is my daughter and I truly know the amazing love and passion she has for Medora, the musical, and for performing. 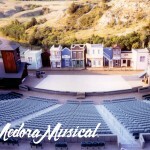 It brings us much joy to witness this passion each and every time we attend the musical and enjoy the wonder of Medora! Love the musical and all the efforts put into it. Its a lot of work for a certain group of people and we appreciate your work! Big round of applause to the musical and those who make it possible!